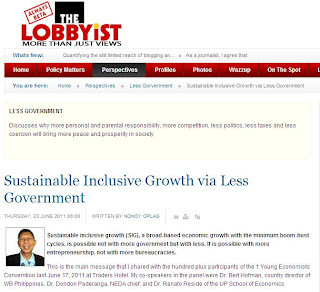 Sustainable inclusive growth (SIG), a broad-based economic growth with the minimum boom-bust cycles, is possible not with more government but with less. It is possible with more entrepreneurship, not with more bureaucracies. This is the main message that I shared with the hundred plus participants of the 1 Young Economists Converntion last June 17, 2011 at Traders Hotel. 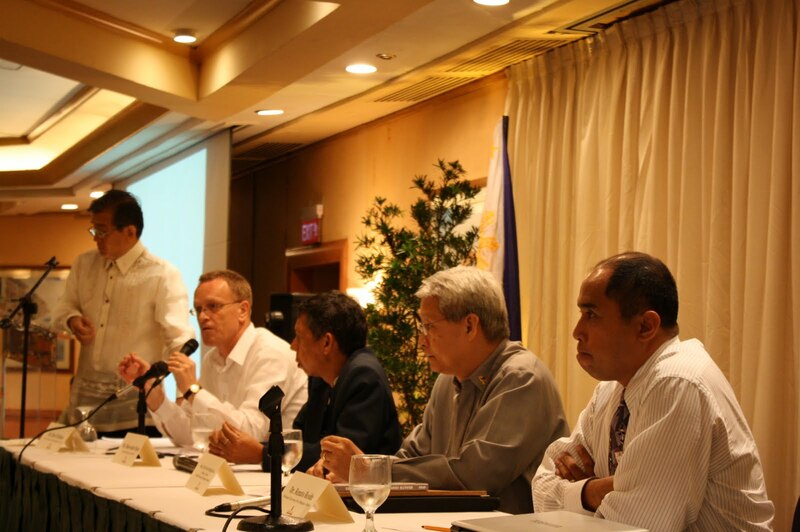 My co-speakers in the panel were Dr. Bert Hofman, country director of WB Philippines, Dr. Dondon Paderanga, NEDA chief, and Dr. Renato Reside of the UP School of Economics. People are not just consumers and recipients of government welfare as what some pro-population control groups claim.. People are producers, they are entrepreneurs and workers, and they are taxpayers. When hindrances to the people’s entrepreneurial spirit are reduced or abolished, a real broad-based economic growth will come out. The conventional perspective to attain SIG is via more government. Like more social programs to attain the UN Millennium Development Goals (MDGs), more WB-ADB loans, endless welfare programs like education and healthcare for the poor, housing and transportation for the poor, agrarian reform for the poor, irrigation and credit for the poor, cash transfers (CCT) for the poor, and soon, condoms and pills for the poor (RH bill). There are lots of central planning and forced income redistribution in economic and social sectors that are involved in this philosophy. I argued during the forum that SIG is better attained if we have less government: less regulations, less bureaucracies, less spending, less borrowings, and less taxation. My presentation was divided into three main themes: Free market and the poor, Government bureaucracies and the poor, and Inequality and the poor. In Part 1, Free market and the poor, I discussed that when the problem in society is the lack of supply of certain goods and services (ie, supply is smaller than the demand) resulting in the rise in prices of those goods and services, the solution is not politics, not price control, not government raids of shops and warehouses, not more bureaucracies. The solution is to allow other entrepreneurs to fill in the supply gap, whether of the same goods or their substitutes. For instance, if there is large scale supply gap of bangus or tilapia because of heavy fishkill, just allow the increased supply of chicken, pork, vegetables and other food substitutes, and consumers will still have a wider option about food to prepare and eat. Another solution is to allow free trade. The main goal of protectionism is to make otherwise cheap goods become expensive, so that the local industries that sell expensively will be protected. Free trade moves the supply curve rightwards, resulting in price reduction and supply expansion. Free trade thus expands the choices and options for the consumers, and even for producers and manufacturers who want more options in the use of capital goods and raw materials. Free trade is pro-poor. Take the case of Hong Kong. Hong Kong does not need any Free Trade Agreement (FTA), Most Favored Nation (MFN) and related contracts, nor the World Trade Organization (WTO). HK simply declared a unilateral trade liberalization policy. Zero government to government negotiations, agreements and protocols. In fact, the WTO can be abolished and HK will not care a bit, it will not be affected. Unilateral free trade is unconditional opening of borders to foreign goods at zero tariff. The only imported goods that HK subjects to government regulations are perhaps guns, bombs, poisonous chemicals and substances, drugs, shabu, virus-infested food products and drinks. In short, only when goods would possibly affect public health and security, that government regulations come in. Otherwise, it steps back, no unnecessary bureaucracies and taxation. Thus, HK is able to efficiently utilize its bright minds. Away from trade politics towards actual trading and money-making. HK does not pay for trade negotiators, trade lawyers, and pay for their junkets in various global trade talks. And taxpayers keep their money, the poor have more jobs and increasing income. In Part II, Government bureaucra-cies and the poor. I showed this slide, the various government permits that entrepreneurs should display in their stores, shops and restaurants – barangay permit, sanitation permit, electrical permit, location permit, fire department permit, Mayor’s permit, SSS permit, DTI or SEC permit, etc. 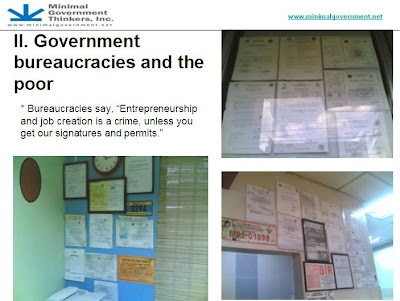 The government bureaucracies are simply saying, “Entrepreneurship and job creation is a crime, unless you get our signatures and permits.” That’s how government loves entrepreneurship and the entrepreneurs. In the Doing Business 2011 Report, an annual study done by the WB-IFC, here are the bureaucracies and taxes that medium-sized companies in the Philippines have to face. To start a business: 15 procedures in 38 working days, costing nearly 30 % of per capita income. In Paying Taxes: 47 diff. taxes and fees per year, 196 hours (or 24.5 working days). Profit tax is 21.3 % but when various mandatory labor and social security contributions are included, total tax rate is 45.8 % of a corporation's profit. 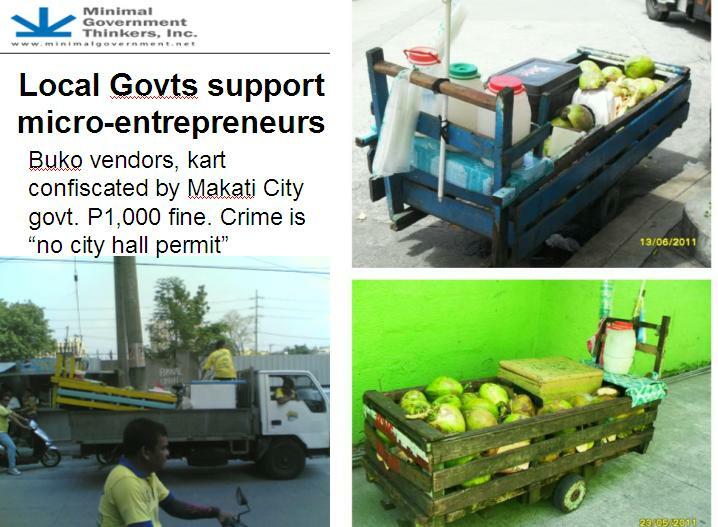 From my interview of some of those buko vendors, the penalty is P1,000, no receipt. They complain that if they steal, they will be arrested. If they work legally, their goods or kart are confiscated.Yeah, that’s another instance of how government loves the poor and the micro entrepreneurs. Many poor people want to stand on their own, to be self-reliant, to seek little or no government subsidies is there. These micro entrepreneurs simply want freedom from government harassment, freedom from high business permit fees and taxes. 1. Inequality respects and rewards hard work, efficiency and ambition. 2. There are people who have little or zero ambition in life. To drink and party everyday, to rely on some outside support for their continued existence are their joys and complacency. 3. Between the two, inequality is sure to happen in the short term, and such inequality will widen over the long term. 4. Government welfare and entitlement programs that are meant to reduce inequality and improve equality among the people are mostly unproductive. 5. Government policies of institutionalizing forced equality penalizes hard work, performance and being ambitious. 6. When the poor and initially less ambitious see that there are less entitlements coming, they will become more self-driven and independent, & society can progress faster. When being poor is rewarded with lots of welfare programs and such programs have no timetables, then there are implicit incentives to remain poor. Society will be better off if there are more personal responsibility assigned to people and less government responsibility, less bureaucracies, less taxation. 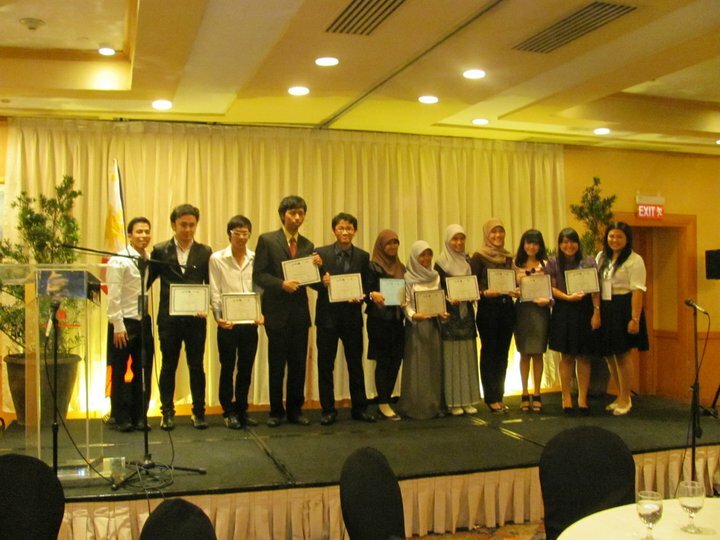 Here are some pictures during the 10th Young Economists Convention (YEC) last Friday, June 17, 2011, at the Traders Hotel. 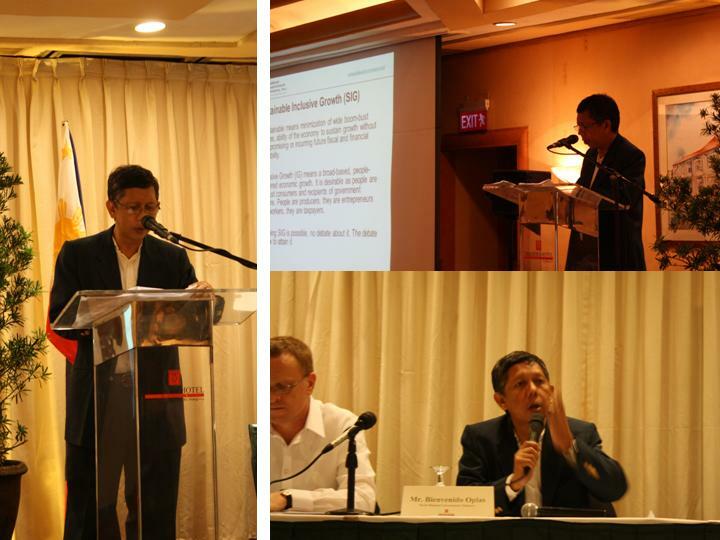 The event was sponsored by the Angelo King Institute (AKI) of De La Salle University (DLSU), Konrad Adenauer Foundation (KAF), and a few other institutes. 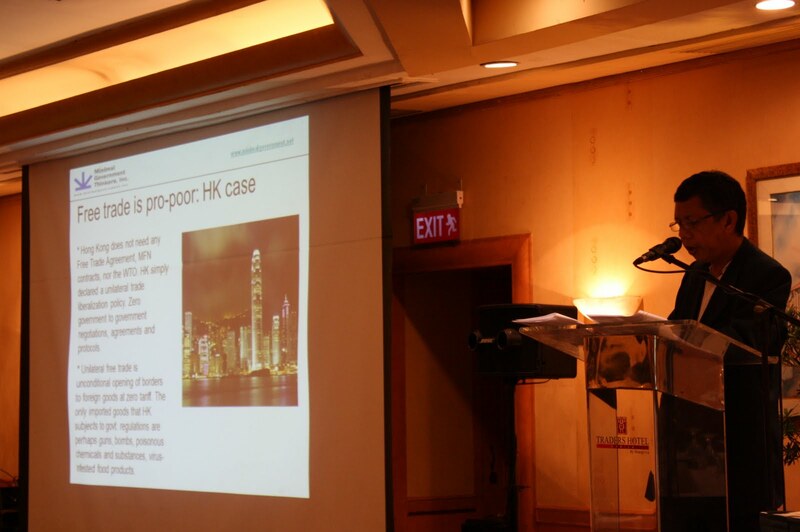 In Part 1, Free market and the poor, I showed this slide about the case of Hong Kong which has a unilateral trade liberalization policy. Free trade simply means more options, more choices for the consumers, rich and poor alike. Whereas protectionism means less choices, higher prices, for the consumers. See Part 1. From left to right: Dr. Tereso Tullao, DLSU Professor who acted as moderator in the morning panel; Dr. Bert Hofman of WB Philippines; me; Dr. Dondon Paderanga of National Economic Development Authority (NEDA), and Dr. Renato Reside of UP School of Economics (UPSE). Bert discussed about social inequality and why it is a bad thing; hence, the various government programs (aided and/or funded by the UN, WB, ADB, other multilaterals) to improve equality. Dondon also talked about improving equality as contained in the Medium Term Philippine Development Plan (MTPDP) 2011-2016. Me, I discussed Why inequality is good. See again Part 1 of this discussion. 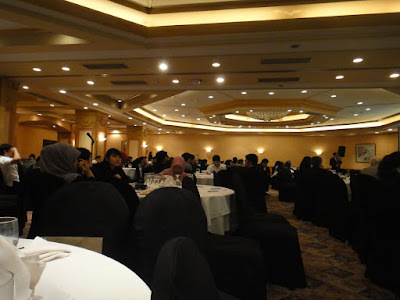 More pictures when I was speaking, and during the open forum. Jan Dominic Bolus, a friend in facebook and was among the organizers of the conference, asked me how receptive the Filipinos are to the free market ideas. I answered that by nature, people including Filipinos are free marketers. Why? The price of food, clothing, shoes, school and home supplies are rising. Ordinary people do not go to the streets to demand that the President, or the Department of Agriculture (DA), or the Department of Trade and Industry (DTI) or any other government agencies should impose a price control, or give endless subsidies to local producers. None of that. People go to Divisoria, Baclaran, Quiapo, tiangge-tiangge (literally market-market), public markets, and seek cheap goods available there. How young are these "Young Economists"? As young as university students, economics and business majors. While the majority of participants are from DLSU, there were also participants from other schools, including a few participants from Thailand, Indonesia, and other Asian economies. I did not see this event, Jan included this among the pictures that he sent. They must be recipients of some awards. I was happy to become part of the YEC. It is important to remind young people that society lives off on productive work and entrepreneurship. Societies that are dominated by the political class and the bureaucracy are less developed, especially if such class of people do not know how to respect the rule of law.